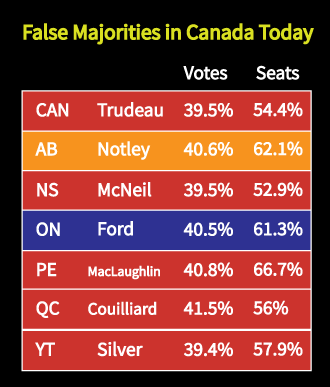 First-past-the-post delivers majority governments to parties with 39% of the vote. After almost every election, the majority of voters have NO SAY in government decision making. With one party having 100% of the power, it often appears that the government is run by one person and some backroom party strategists. Sometimes first-past-the-post even produces a “wrong winner” election – when one party receives more popular support, but another party gets to govern with a majority! This happened in BC in 1996, when the Liberals received more votes than the NDP, but the NDP got all the power. Other times, one party can sweep almost every seat, almost obliterating any opposition. This happened in New Brunswick in 1987, when the Liberals got 60% of the vote but won every seat – leaving no opposition. With proportional representation, if a party earns 40% of the vote, they get 40% of the seats. Parties share power and work together to create policies which are supported by MLAs representing a genuine majority of voters. Many voters feel they must plug their noses and vote “strategically”. Many voters feel they must vote for a candidate who is not their first choice – “the lesser evil” – to prevent a party they don’t support from gaining power. Strategic voting often doesn’t “work”as intended – because it’s so difficult to predict what other voters, who may have a different “strategy”, are doing. A strategic vote is most often for one of the larger parties, masking diversity and the real support for the smaller parties in the election results. Even when an organized strategic voting campaign does succeed in shifting the vote in the desired direction, many voters are left with the feeling that the government or MLA they elected by strategic voting was not what they really wanted. With proportional representation, you vote for what you truly believe in, and help elect an MLA who shares your values! About half the votes cast don’t count. In most elections with first-past-the-post, about half the voters cast a ballot which elects no-one and has no impact on the election result. This can making voting feel futile. Many voters feel their MP is not responsive to their concerns and is little more than a salesperson for their party in the riding. 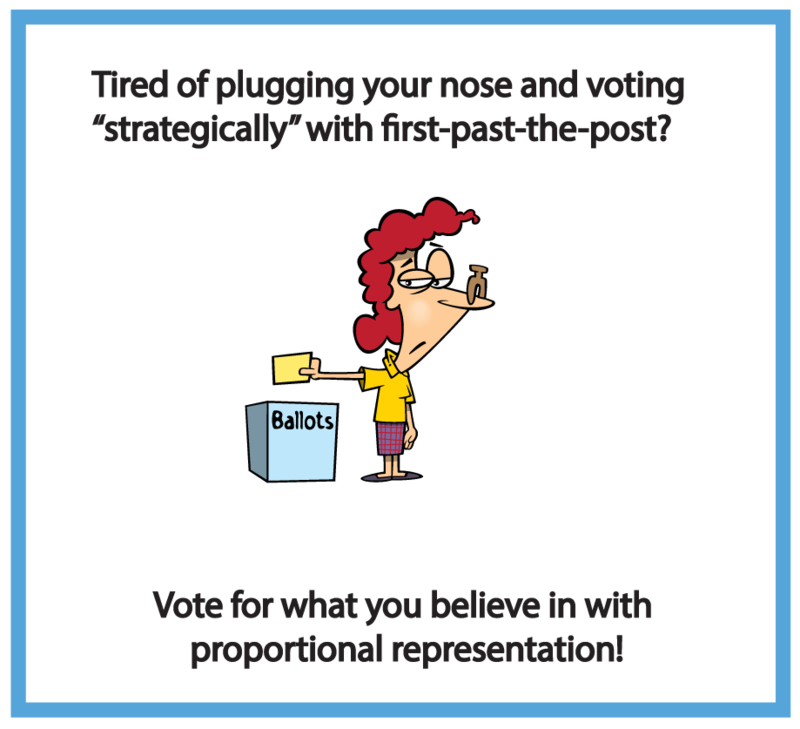 With made-for-Canada proportional representation, about 95% of voters will cast a ballot which helps elect a representative from the party of their first choice! 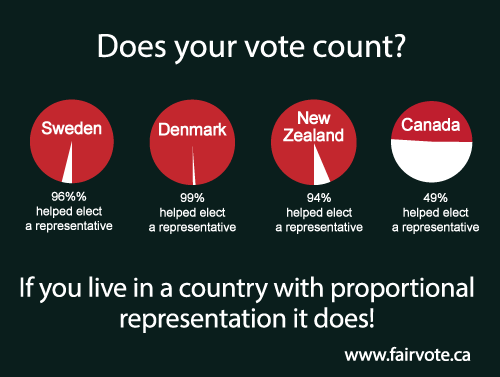 Voter turnout is 7% higher on average in countries with proportional representation. First-past-the-post serves the self-interest of parties and politicians – not BC voters. When electoral reform appears to have a real chance, the opposition can become vehement, with parties channelling incredible energy and money into defeating proportional representation. Why do big parties often oppose a switch to PR? a) POWER. Big parties would rather run the government themselves – even if only 40% voted for their agenda – than have to cooperate with other parties. Negotiation, compromise, and incorporating other viewpoints are inconveniences they don’t want to be bothered with. b) CAREER SELF-INTEREST. Many of the MPs elected now have seats in regions where one party swept every seat in the region thanks to first-past-the-post. Some regions have been made up of mostly “safe seats” for one party for decades. With proportional representation, when results reflect the popular vote and the true political diversity of the region, some of those MPs will not be re-elected. Ever wanted to vote for a particular party you support, but the candidate they were running in your riding was a loser? Many proportional representation systems mean you’ll have more than one candidate of the same party to choose from. This means voters can ensure the best MPs from each party get elected, and those that aren’t responsive to voters aren’t re-elected. PR also means that you’ll have a choice of MPs to approach with your concerns. Many politicians don’t want you to have that choice – on the ballot, or after the election – because they don’t want the competition. Why do big-moneyed interests usually oppose PR? Answer: It’s easier to lobby a one-party government. If you’ve ever wondered if some pieces of legislation were co-written by a lobby group with deep pockets, you might be right. It’s more difficult for these groups to convince two or three parties in a coalition government to do what they want than to cozy up to a single party government. Salomon Orellana’s research showed that proportional representation makes a country better able to limit the degree to which powerful economic interests can influence policy to their advantage at the expense of the common good. More voices at the decision making table, representing more voters = more accountability. Could the party who holds the seat in your riding run a fence post and probably win? Living in a “safe seat” makes voting feel especially futile. 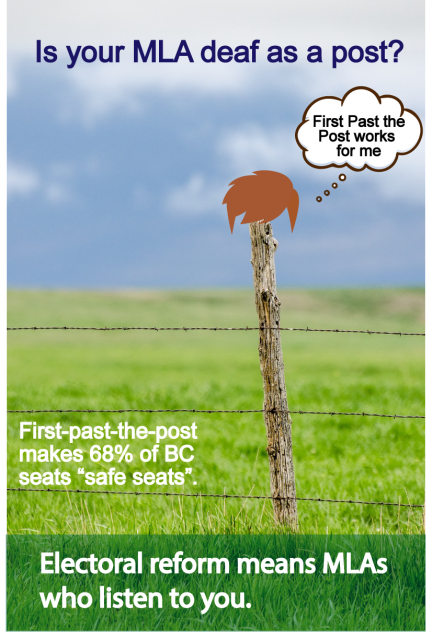 For example, provincially in BC, 68% of the seats are “safe”. Party leaders largely ignore safe ridings – the leader’s tour bus does not stop there. Elections are fought in a handful of swing ridings, while many voters are ignored. Parties which never win your riding may have trouble finding quality candidates to run, and may not even run a candidate in the safest seats. Parties with a lot in common spend much of their time attacking each other. When every riding is a one-winner, zero-sum game, parties competing for the same voter are likely to sling mud. This kind of hyper-partisan politics turns many voters off. In the legislature, there’s little incentive to praise or even acknowledge the good ideas of another party. Even in a minority government, the party strategy involves watching the polls for the right moment to trigger an election – hoping a few swing votes will produce a majority government. With each riding or region electing multiple MPs, rather than just one winner, each party seeks to maximize its own seat count without tearing down its allies. First-past-the-post is an archaic system. Most of the world has moved on. Canada is stuck with a horse-and-buggy electoral system that most countries ditched long ago. 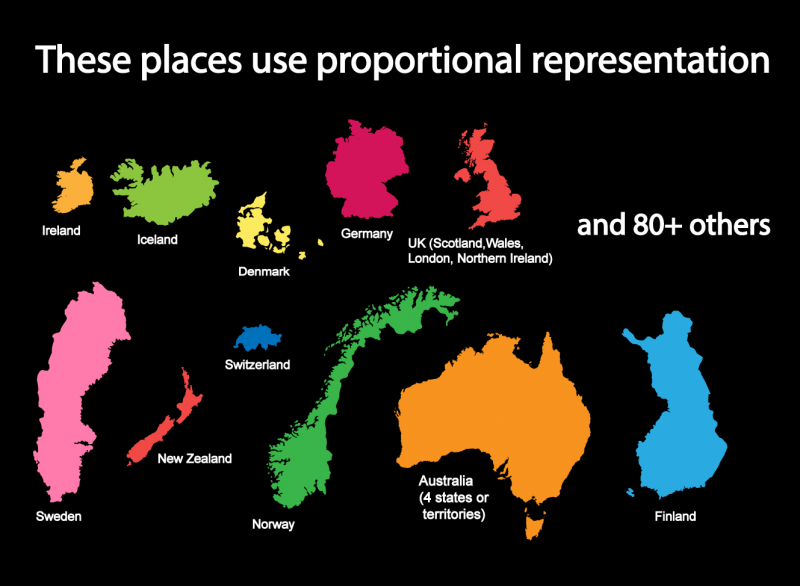 Most western democracies – our peers – use proportional systems. Canada, the U.S. and the UK are the last countries hanging on to first-past-the-post – and even the UK uses proportional systems for its devolved assemblies. During the recent federal ERRE hearings, 88% of the experts who testified were in favour of proportional representation. 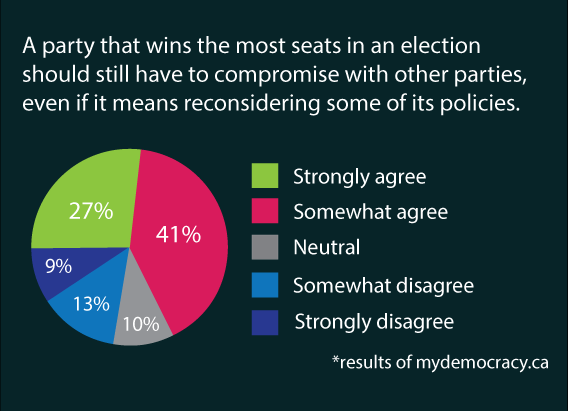 First-past-the-post was supported by almost no-one – except the big party incumbent politicians! Around the world, the trend is towards proportional voting systems that give voters fair results, and more choice. No-one is adopting first-past-the-post.